Public bins for getting rid of drugs are being rolled out up North, but could they be introduced here? Ireland is due a new National Drugs Strategy next year. PUBLIC BINS FOR disposing of prescription or illegal drugs are being rolled out across Northern Ireland following a successful pilot programme, the Public Health Agency announced yesterday. The bins were previously introduced in a certain number of areas as part of the pilot programme, mainly in Belfast and South Eastern and Northern Health and Social Care Trust (HSCT) areas in Northern Ireland. There are currently 14 bins in existence in these areas, and the HSC said that over 65,000 tablets (over 90% of which have been prescription drugs) have been taken off the streets through this project. 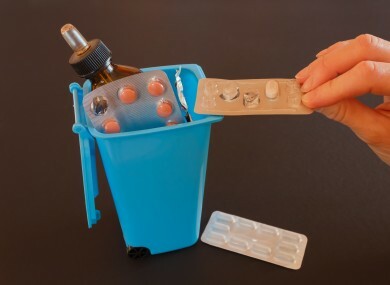 The bins are being rolled out nationwide now as part of an initiative known as RAPID (Remove All Prescription and Illegal Drugs), which has a number of aims in reducing the numbers of drugs in communities. Removal of prescription and illegal drugs from communities. Informing communities of the effects and dangers of using drugs. Collaboration between statutory bodies and and community organisations to make areas safer. The bins are set up in public places in certain areas and give people a chance to dispose of drugs in a safe way by just dropping them in a box. The items can be deposited anonymously and will be regularly emptied by the PSNI, which will record information on the drugs before they are destroyed. No personal details are collected, but the PSNI said the drugs may be tested by Forensic Science Northern Ireland to identify them and assess their toxicity. Drug and alcohol coordination teams will work together with local communities to identify suitable locations for the bins to be placed. The HSC said it hopes to have bins in place across Northern Ireland by then end of 2016 or early 2017. Are there plans for bins in Ireland? Ireland’s current National Drugs Strategy for dealing with drugs will come to an end this year. A Steering Committee for advising Drugs Minister Catherine Byrne has been set up to work out the development of a new strategy from 2017 onwards. A spokesperson for the Department of Health told TheJournal.ie that the strategy would look at the approach taken in other countries in relation to drugs policy while it is being set up. “Including harm reduction options and preventative measures such as public bins for the disposal of prescription or illegal drugs,” the spokesperson said. A wide-ranging consultation process is also planned to give key stakeholders and a public a chance to air their views. The final report of the Steering Committee is due to be submitted to the Minister by the end of the year. Dublin City Council earlier this year ran a pilot programme introducing bins for the disposal of syringes in Dublin. One of the syringe disposal bins in Dublin. The bins were set up in certain areas in the inner city as part of a pilot scheme, in what was believed to be the only such outdoor scheme in the UK and Ireland. It is believed that more of the same bins will be introduced across other areas in Dublin later this year. Read: Spotted these odd-looking bins in Dublin and wondered what they’re for? Email “Public bins for getting rid of drugs are being rolled out up North, but could they be introduced here?”. Feedback on “Public bins for getting rid of drugs are being rolled out up North, but could they be introduced here?”.